"When I venture out into the landscape the furthest thing from my mind is to try and capture what is happening in front of me. I am more interested in what is happening to me because I know that what I am experiencing and seeing is something that needs to be treated as just that; something to see and experience. Not something to capture. If I try and capture the facts, the reality, I lose the moment I am experiencing. I become distracted from the task at hand and I truly believe that my part in making art is about being present in the experience of the moment and at some distant point trying to find a way that will resolve the elements into a form, shape or composition that will draw attention to something, some part, of what I have felt and seen personally"
Andrew Carter was born in Goomalling in rural Western Australia in 1957. He has committed himself to the study and practice of the visual arts since he started tertiary studies in 1977. Carter received a Bachelors Degree in Industrial Design from Curtin University in 1979 and his Masters Degree (MFA) from Yale University in the United States in 1984. He has received several grants and awards for his contribution to the visual arts including the Creative Development Fellowship for The Visual Arts from the Australian Government and a Green Room Award for Design in Melbourne. 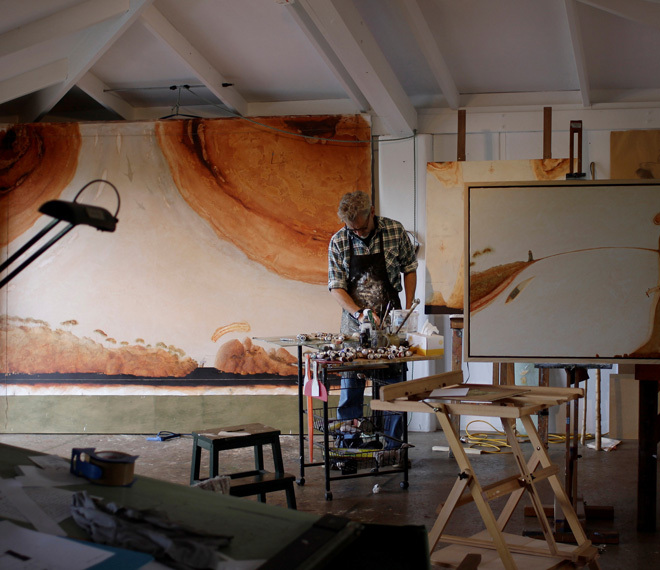 Carter has been represented by many leading commercial art galleries with numerous solo and group exhibitions over his career. His works hang in many private collections both in Australia and overseas.